The Nintendo GameCube may have been discontinued for over a decade, but the GameCube controller is the controller that simply refuses to die. The reason why can be summed up with one game series, Super Smash Bros. Many Smash fans first encountered Smash in the GameCube edition, Super Smash Bros. Melee. They liked how the GameCube controller controlled the characters. When the GameCube's successor, the Nintendo Wii, was released, it was backwards compatible with GameCube games and had four ports for GameCube controllers. The Wii edition of Smash, Super Smash Bros. Brawl, was able to use GameCube controllers instead of the Wii Remote + Nunchuck. Eventually Nintendo removed the GameCube controller ports and backwards compatibility from the Wii in the "Family Edition", but by that time the Wii was entering its twilight years. 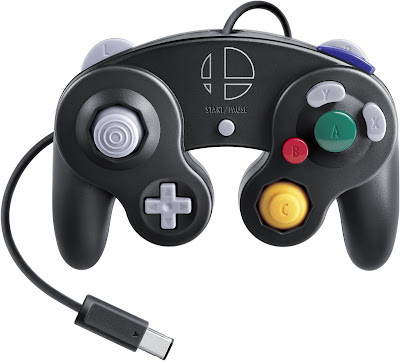 When Super Smash Bros. for the Nintendo Wii U was released, Nintendo made the unusual move of releasing an GameCube to USB adapter to allow players to use GameCube controllers on the Wii U. Not only did they release the adapter, but instead of requiring Smash fans to get their old controllers out of storage or find used ones at Gamestop, they released newly made wired controllers. These controllers are easy to distinguish from original GameCube controllers by the use of a fiery Smash logo. 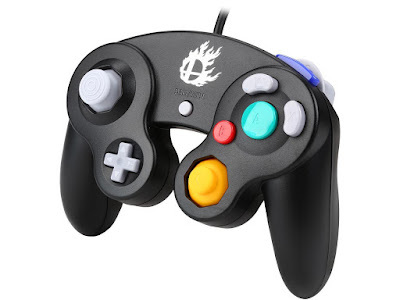 Third parties also made GameCube-like controllers for Smash, but these had USB connectors that could plug directly into the Wii U. I do not recall any wireless GameCube controller solutions being released at the time and people were disappointed Nintendo did not make new Wavebird wireless GameCube controllers. The $19.99 GameCube Controller Adapter was hard to find at first and scalped on ebay, but eventually Nintendo released them in sufficient quantity to satisfy demand. Nintendo has just released Super Smash Bros. Ultimate for the Nintendo Switch. They have brought back the GameCube Controller Adapter and the GameCube Controller, branded slightly differently this time. The logo is no longer fiery. The Controller Adapters and Controllers you can buy now during the Switch's heyday or could buy during the Wii U's heyday work with both systems and the controllers work in the original GameCube and pre-Family Edition Wiis. There are some minor differences between the construction of the old and the newer controllers and the newer controllers are a bit lighter than the originals, but the new controllers are still high quality products. Currently, the GameCube controller is only available in black, but at $29.99 it is a fair price to replace lost, broken or worn out original controllers. A company called PowerA is going to release a licensed Bluetooth wireless GameCube-style controller for the Switch later this month, but unless someone makes a Bluetooth adapter for a GameCube port, you won't be able to use it in the older systems, but you might be able to use it in the Wii U. 8bitdo is a Chinese company that acquired a reputation for delivering quality Bluetooth wireless controllers. They sell quite a few and most of their controllers clearly being inspired by the SNES controller's design. Some come with thumbsticks, some do not. Some are larger with wings, others are small and portable. They also market an arcade stick with a microswitch joystick and buttons. At present they have 26 Bluetooth controllers for sale. These controllers are not compatible with vintage consoles on their own, but can be made compatible with NES and SNES consoles through the 8bitdo Retro Receiver. 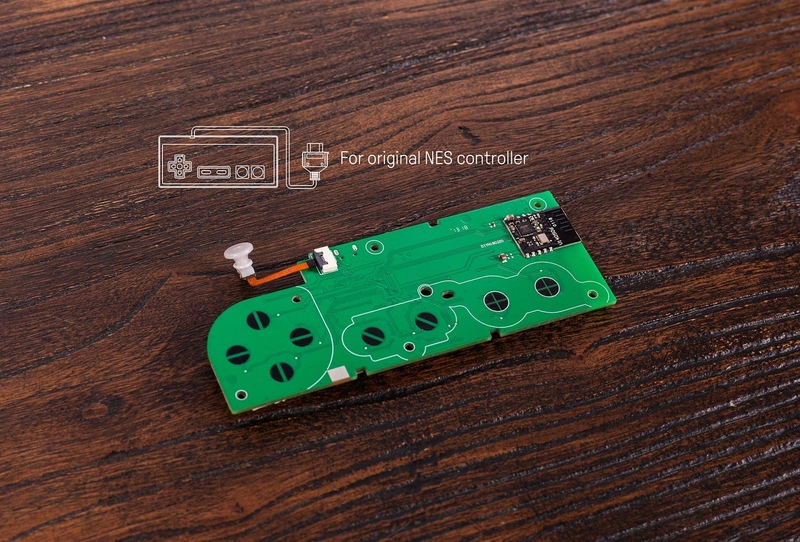 8bitdo sells a Retro Receiver that fits into a NES controller port and a Retro Receiver that fits into a SNES controller port, but they otherwise function identically. They add about 1 frame of lag due to the use of the Bluetooth protocol and should never be used in a multi-tap or four player adapter due to their current draw. Generally speaking, the 8bitdo is a quality controller. The build quality is good, the plastic is not cheap and the buttons have a snap to them. 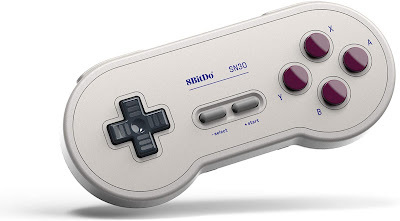 The 8bitdo controllers have been the subject of some criticism because the diagonals on their controllers' D-pads are much easier to activate than the diagonals of an original NES or SNES controller. This is due to the baseball shape of the contact pads on the PCB. Some people have recommended covering the inner half of each contact with tape, but I found that made some directions harder to press generally. One solution to the loose diagonal issue can be found in one of 8bitdo's newest products, the DIY kits that turn your original NES or SNES controller into a wireless bluetooth controller. 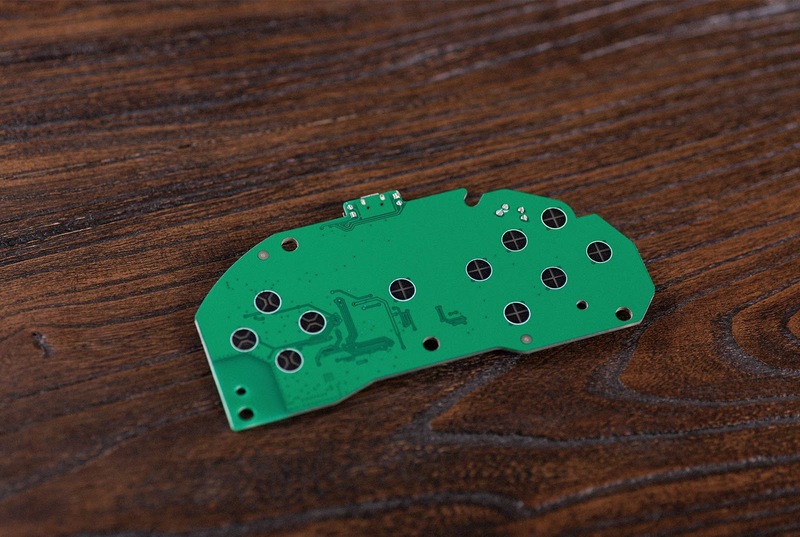 These DIY kits are PCB replacements for your original controllers. What is interesting about the NES and SNES DIY PCBs is that the D-pad contacts are now semi-circles like they were on the Nintendo-manufactured PCBs. This should mitigate the issue of unwanted diagonals. There are also kits available for NES and SNES Classic Edition controllers, so you can use those controllers on your original consoles with the Retro Receivers. There is a DIY version for the Sega Genesis 6-button controller, but the D-pad contacts retain the baseball configuration of most 8bitdo controllers. I have used a NES Classic controller and like the build quality and button feel overall, and I cannot recall reading any complaints about the SNES Classic controller's build quality and button feel. If you are looking for a quality solution to use wireless controllers on your NES and SNES, the Classic controllers with the DIY kits may work for you. Krikzz, the creator of the EverDrive flash carts, has decided to remove himself from his comfort zone to make a wireless six-button Genesis controller called the Joyzz. 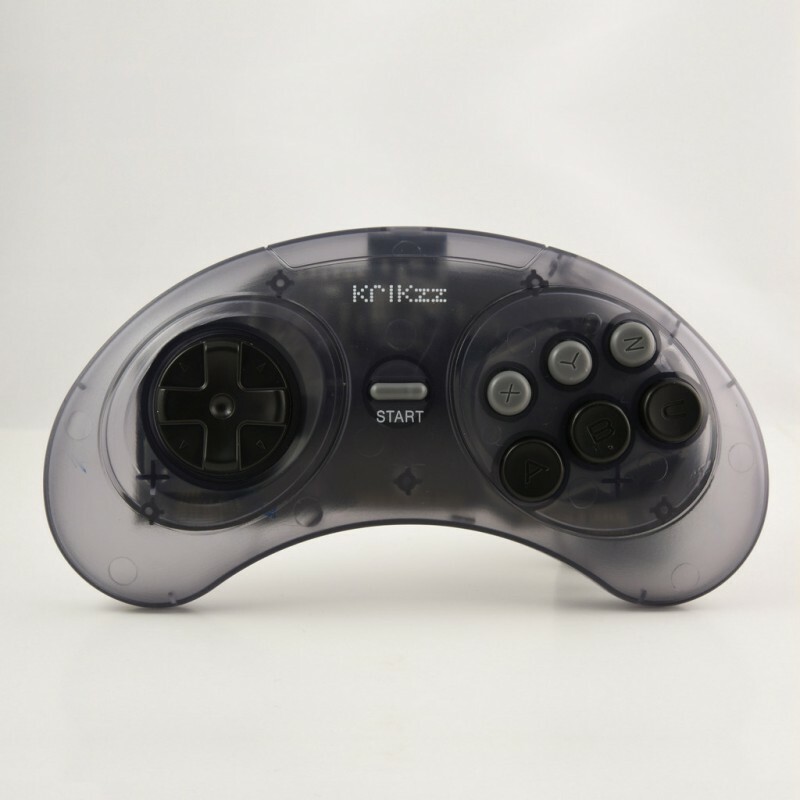 The Joyzz comes in black and translucent shells. It uses 2.4GHz technology and comes with a receiver to plug into your Genesis controller ports. The lack of Bluetooth usage cuts down lag to almost nothing, but it does limit your ability to use the controller with modern devices. Recharging is done via mini-USB. Krikzz has thoughtfully allowed user to set the controller into a 3-button mode controller to work with those Genesis games that only work with a 3-button controller. In addition, he has also included a Sega Master System compatibility mode for those games requiring the 2-button controller used by the SMS. There was one functional and one cosmetic complaint about the first batch of Joyzz shipped. The functional complaint was that the D-pad was angled rather than straight. Krikzz sent out new D-pads to those who complained and new Joyzzs do not have that issue. The The cosmetic complaint is that the oils from fingers can rub off the Joyzz and Start logos on the controller. The Joyzz, at $65, is not an inexpensive option. It will soon have competition from 8bitdo, which is introducing the M30 controller (in white and black colors) to coincide with Analogue's Mega Sg. The 8bitdo controller is also a 6-button controller and it has a few extra buttons, perhaps to enter the menu of the Mega Sg. It comes with 2.4GHz wireless receivers for minimal lag. The M30 will cost only $24.99, undoubtedly due in part to 8bitdo's economies of scale. When the M30 is released in February, I'm sure there someone will post a comparison video between the two. I will be watching out for these videos. 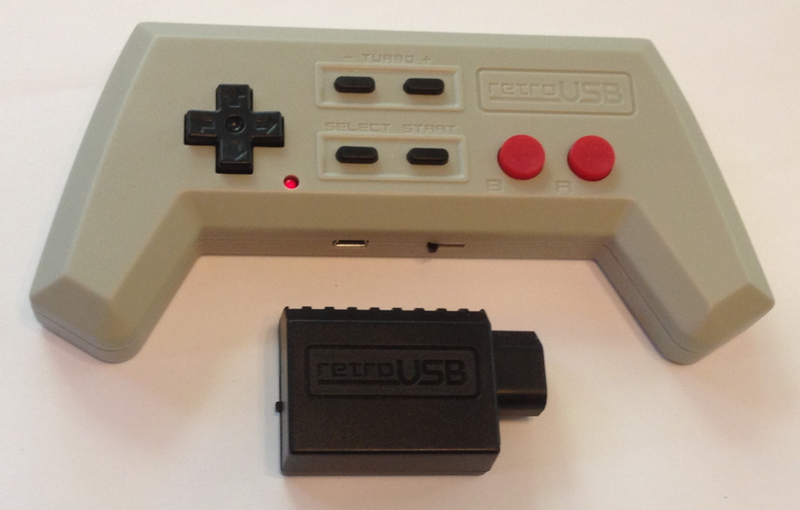 When RetroUSB released its AVS, an FPGA-based NES/Famicom clone console, it promised to release a wireless controller. That wireless controller was a long time in coming after the AVS but it is now freely available to purchase. The controller comes with a receiver that uses non-Bluetooth 2.4GHz wireless technology, so lag is at a minimum. The battery is charged via a mini-USB port. While the controller uses the AVS branding, it is compatible with any NES or Famicom that uses the distinctive 7-pin NES controller port. The Wireless Gamepad has two features of note. The first one is that it has buttons to allow you to adjust the turbo settings on the A and B buttons separately. This is an extremely welcome feature because you often want the fire button (usually B) with turbo and not the jump button (usually A). The turbo can be adjusted, which is good because some games work better with a slight turbo while other games prefer it to be cranked up. It also explicitly supports four player adapters, which suggests the current draw for the receivers is pretty reasonable. The second feature is a tad more controversial. The D-pad and all the buttons use microswitches instead of carbon membrane contacts. Microswitches tend to be appreciated more in arcade sticks than gamepads. They are also relatively loud. Bob from RetroRGB found his Wireless Gamepad difficult to get all the D-pad directionals responding smoothly until he opened up the enclosure. https://www.youtube.com/watch?v=dzcY4oWd9vE Some people may not like the hard angles or the wings of the controller, but the original NES controller had hard edges and points as well. The controller costs $65.00, so if you are willing to spend that much on a unique controller experience, then you should consider RetroUSB's Wireless NES Gamepad. The original N64 controller is an extremely polarizing controller. I personally have never had a problem with it, but other people hate the huge size and the trident shape. Most games do not use the D-pad, so your hands have to be really close together. Of course, everyone has to deal with the fact that the optical thumbstick will wear out at some point. 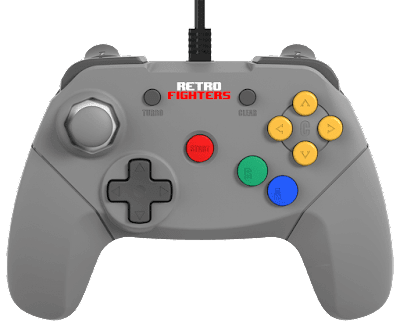 Retro Fighters initiated a Kickstarter campaign to fund their vision of a replacement N64 controller. The Kickstarter was successful. The goals of the Retro Fighters controller were to make the N64 controller more comfortable to hold, better balanced in the hands and give the layout a more modern, symmetrical feel. 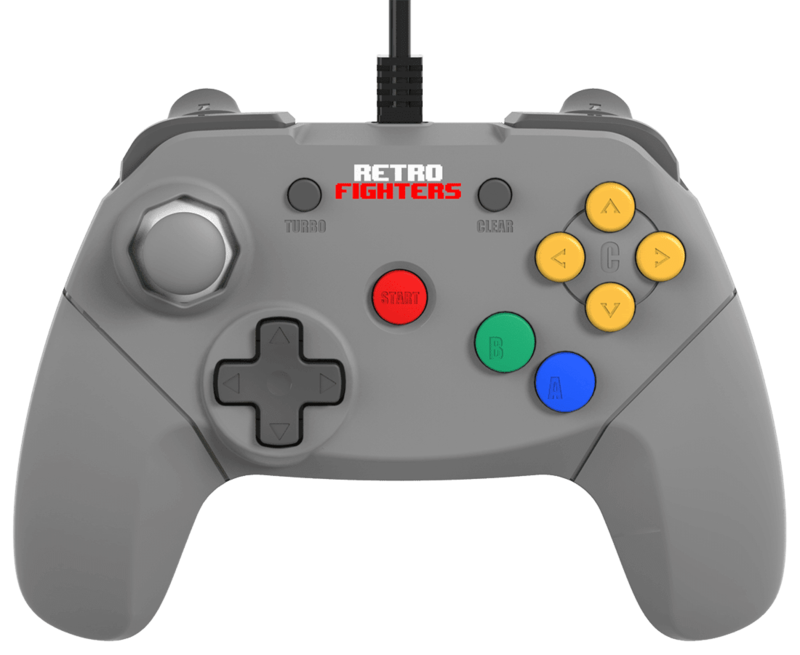 So the Retro Fighters controller has a layout more reminiscent of a GameCube controller. It is still a wired controller, but at $29.99 the price is quite reasonable if the quality is there. The N64 controller has the thumbstick in the middle and the D-pad on the left side. Most N64 games don't really use the D-pad, so Retro Fighters put an analog thumbstick in the prominent place on the left side. Fortunately the D-pad is larger than the tiny ones Nintendo used for the GameCube controllers. The N64 controller also had a Z-button on the underside of the controller. 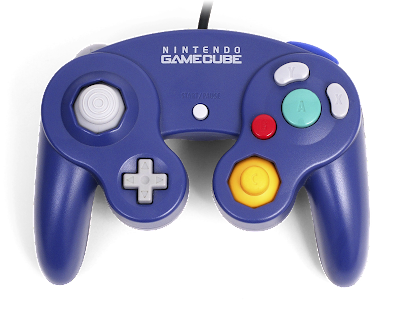 Because the Retro Fighters controller is not held in the same way, Retro Fighters took more inspiration from the GameCube controller and put a pair of Z-buttons behind the L and R buttons. The N64 controller also had a port on the back into which you could insert a Controller Pak to save games for those games which used that accessory, a Rumble Pak which provided rumble features for games which supported it, or a Transfer Pak which allow games like Pokemon Stadium 1-2 to interact with Game Boy cartridges. The Retro Fighters controller supports the Controller Pak and Rumble Pak but not the Transfer Pak. This was communicated to backers during the Kickstarter and refunds were offered to those for whom Transfer Pak compatibility was a deal breaker. When the Kickstarter units were first released to backers, people noticed an issue with the L button and analog stick. Due to their proximity to each other, pushing up on the thumbstick can move the L button so it is no longer pressed down. Additionally, the L and R buttons were connected, which could lead to instances where you press one button and the other one also registers a press. The first batch also had a crooked Controller/Rumble Pak locking tab. So ultimately the Brawler64 controller is a smaller and lighter N64 controller replacement. It comes with a button to activate a turbo function and another button to clear it. Wisely, Retro Fighters allows you to set the turbo function of each button independently. Because the analog stick is reports resistance values, as opposed to the original optical stick which reports a beam of light being broken by spokes of a wheel, the stick may behave a little differently than the original. I really have not read of many complaints, unlike some of the 3rd-party thumbstick replacement products for original controllers. For some reason, companies like Tomee sell NES-Zapper style light guns. 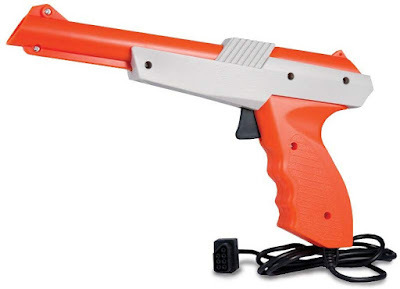 The NES Zapper was bundled with the NES for most of the console's lifespan, so finding Zappers is not a difficult task. As I mentioned at the beginning of this blog entry, controllers from companies like Tomee tend to be cheap and light feeling and are not quality products. But the Zappers sold by Tomee and other third parties deserve a mention here because they offer something the official NES Zapper does not. As we all know, light gun games only work with CRTs. There are solutions perennially in development that can bypass this limitation, but they require additional hardware : https://www.lightgunverter.com/ Also, if you want to use your original Zapper, you will need to attach a Wii Remote to it. One clever hacker named Alexey decided to hack the games themselves to adjust the timing of the black to white flash that many Zapper games use to determine whether there has been a hit or a miss. The lengthier flashes can help overcome the delays inherent in LCD display technologies. So far he has hacked Duck Hunt, Hogan's Alley and Wild Gunman to allow for adjustable delays. He is currently working on Freedom Force. The delays are user settable so the user can find the right about of delay for his screen. You can find his IPS patches for ROMs here : http://neslcdmod.com/ The higher the delay, the longer you will see white hit-boxes on the screen, so it does modify the game experience a little. However, there is something of an issue here. Original Nintendo NES Zappers will not work with these delay hacks. They have 15KHz light filters, so the the Zapper does not sense the transition from light to dark or vice versa at approximately 15,750 times per second, it will not register a hit. CRTs are line based displays and draw 15,750 lines per second, LCDs are frame based displays and draw 60 frames per second. Here is where the Tomee Zapp light gun comes into play. Apparently it does not implement the 15KHz filter. Thus the Tomee gun can work with the LCD game hacks, but whether it will work with your TV is something you will need to test for yourself. I have read that LED-backlit LCD and OLED panels tend to work but older panels that use a CCFL backlight may not. While the Tomee is not the only third-party light gun that works with the hacks, it is easy to find. It looks like a squatter version of the orange NES Zapper. The cable is short and thin, but at $6-10 for a Tomee gun it is worth a gamble if you have a flash cart. Any repro controllers for Twin Famicom?